If you looked at my yard and garden, I would probably deny that years ago I completed the Master Gardener program. It's more to save face for the MG program than myself, lol. However, I still love getting my hands in the dirt and watching things grow. 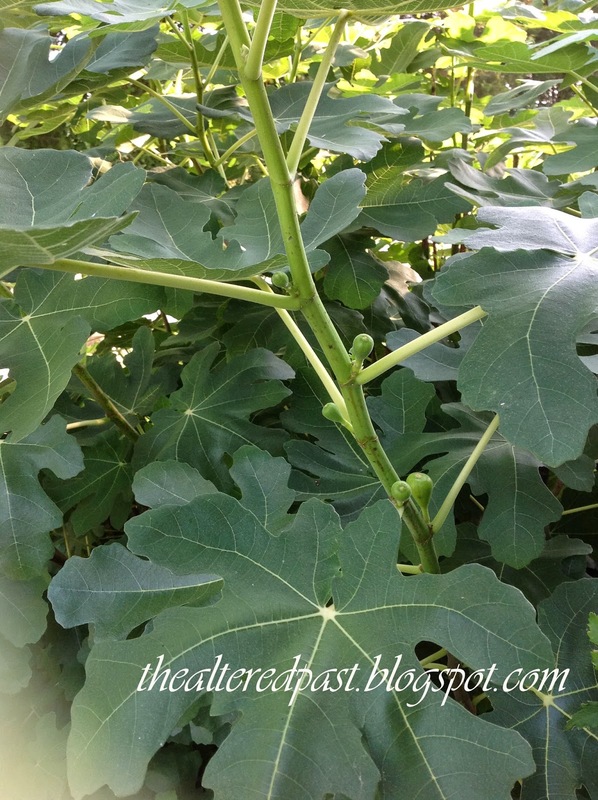 One plant that I found that's super easy to grow and gives a great reward is the Brown Turkey Fig tree. I purchased this fig tree at Lowe's about 5 years ago. 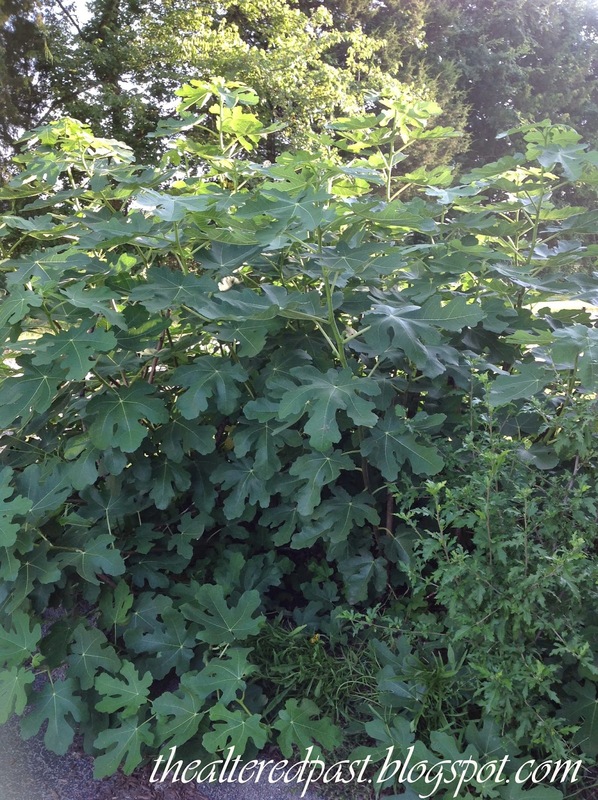 It started as a small plant about a foot tall and has grown quickly to a huge fig producing monster. We are in Zone 7 here in Tennessee and the fig tree has done very well here. Just make sure you plant it in a spot with future growth in mind. I planted a Rose of Sharon on each side of mine and will now have to relocate them. The tree has a very pleasant smell all summer long. It actually smells even more fragrant right after the first frost that kills the foliage. All that's left after the frost are tall bare branches. I cut these back to the ground each winter. New shoots will grow every spring, producing more and more figs. 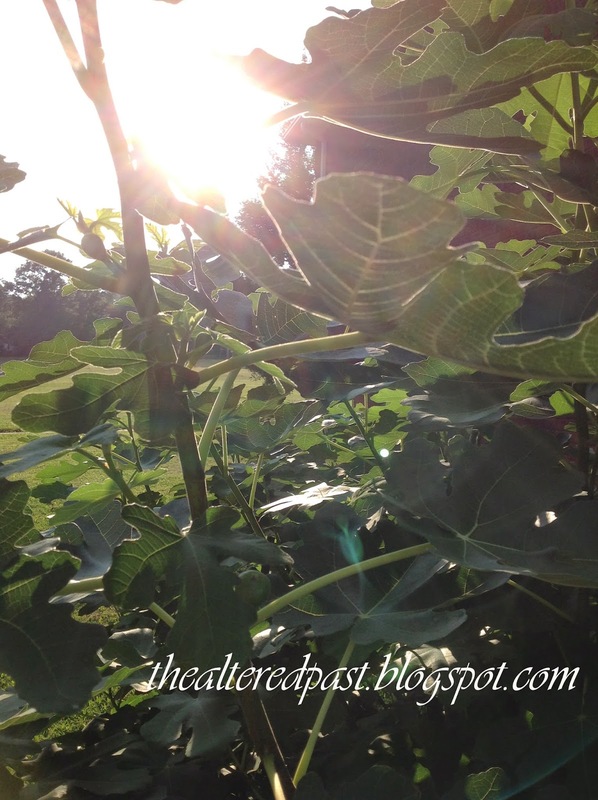 While this season's figs are still green, the picture above is from last fall. 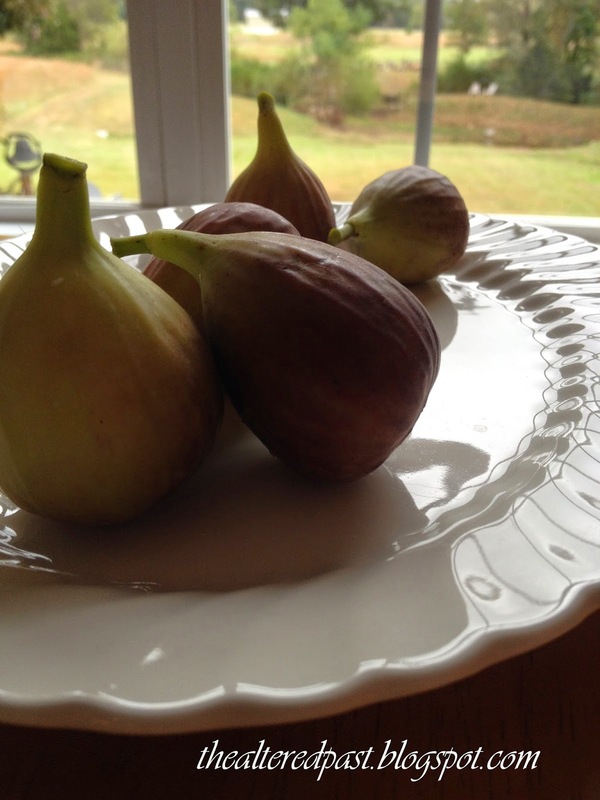 Fresh figs are great but I prefer to dehydrate them. They taste just like a Fig Newton cookie! I also made fig preserves last fall for gift giving. I'll be sharing that recipe later this fall when the figs ripen. I hope you give figs a try. They are super easy and yield a lot of fruit. 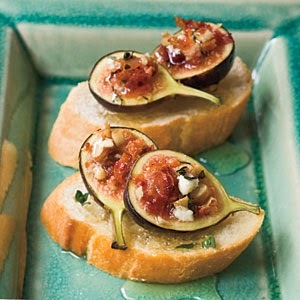 In the meantime, here's a fresh fig recipe to whet your appetite! 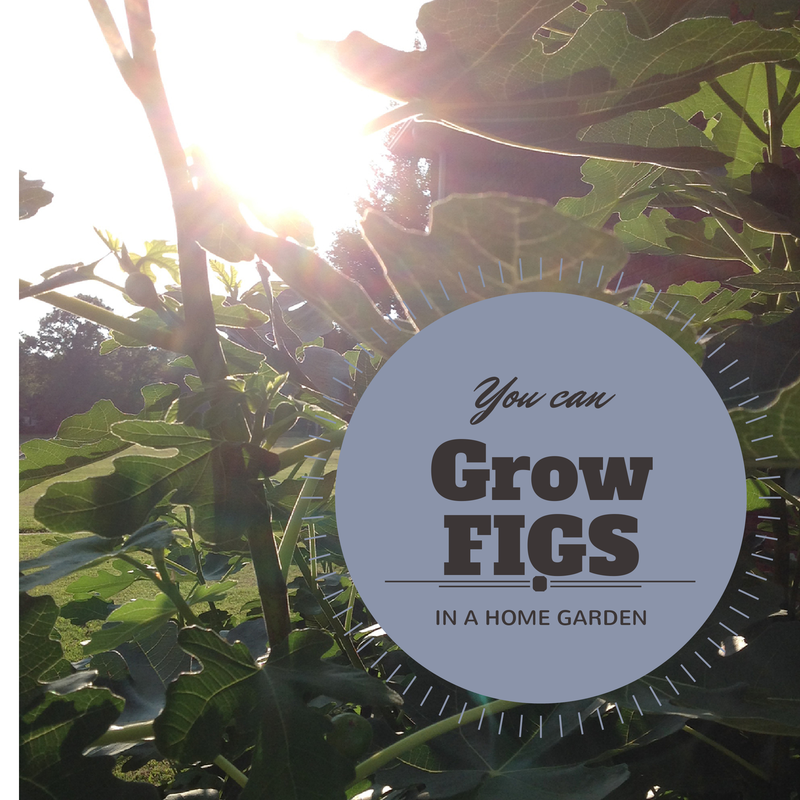 I hope you feel inspired to give growing figs a try. Thanks for stopping by and God bless! Here it is ladies...the very first Reality Check feature! 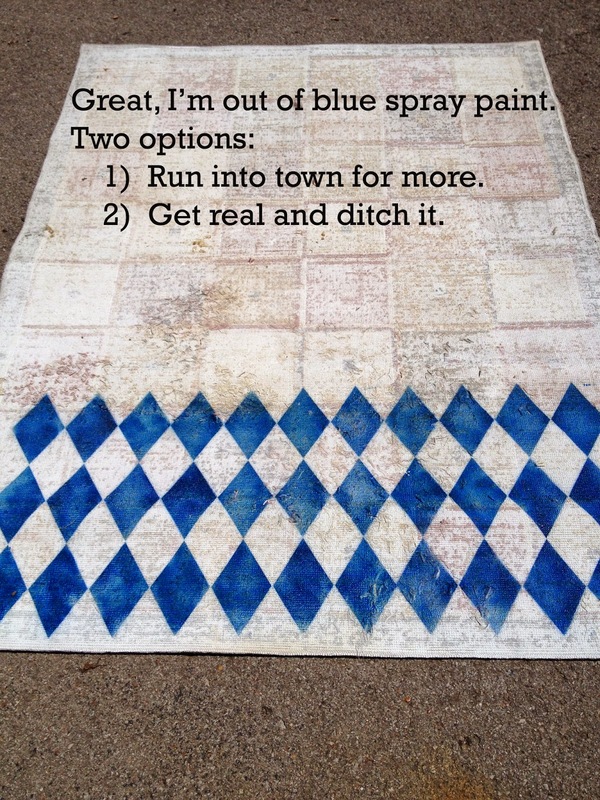 Reality Check is an idea that came to me as I was attempting to upcycle an area rug to use on my deck. DIYers have a drive or a hope that a project has potential. It's what motivates us to keep at something, through the ugly stages, the frustration stages, and the "what was I thinking" stages. 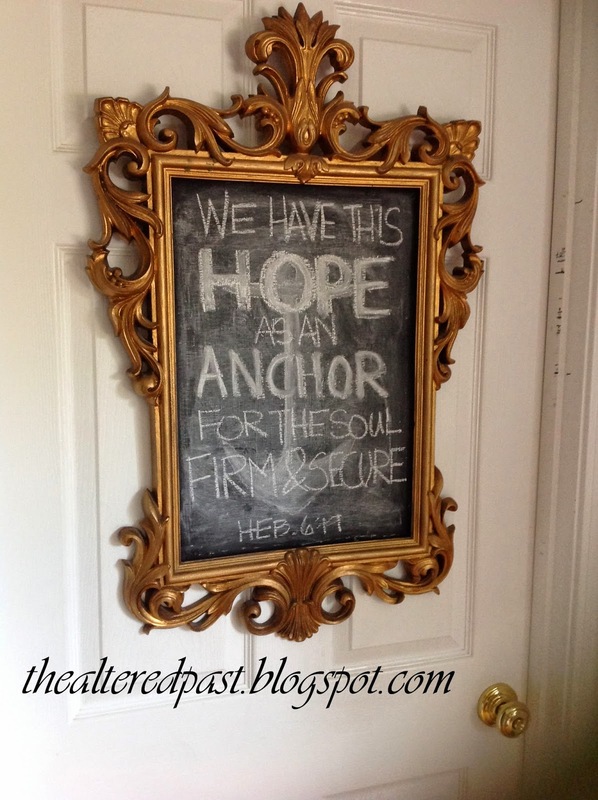 That hope is what pushes us through and we see the results in a great finished product. However, what happens when that hope is driving you and it's really just not happening? 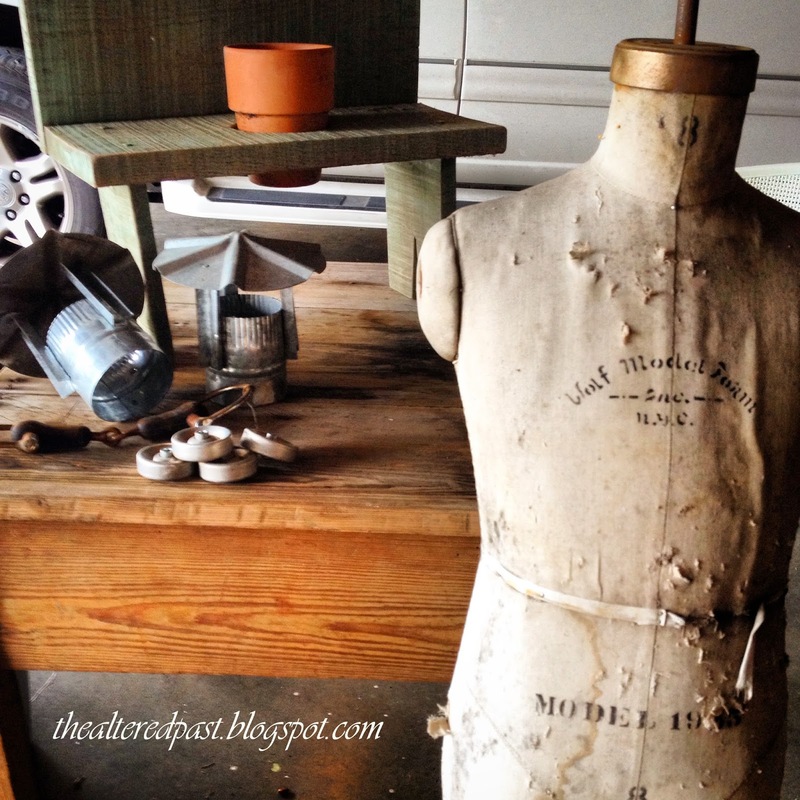 I think many DIYers can relate to the fact that sometimes the ideas in our head don't always translate in reality. 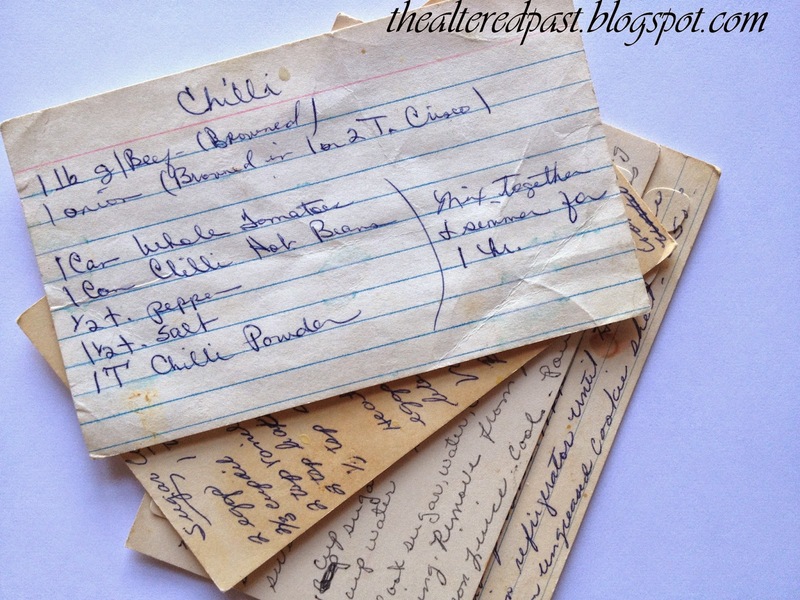 Of course, you may never see those projects displayed on blogs or in magazines. Why should they? They ended up (if they were even finished) bad. In trying to keep it real that not everything I attempt is post worthy, I want to encourage when you have a project that doesn't go as planned, you're not alone. We all do. Sometimes there are projects we just need to scrap and move on. 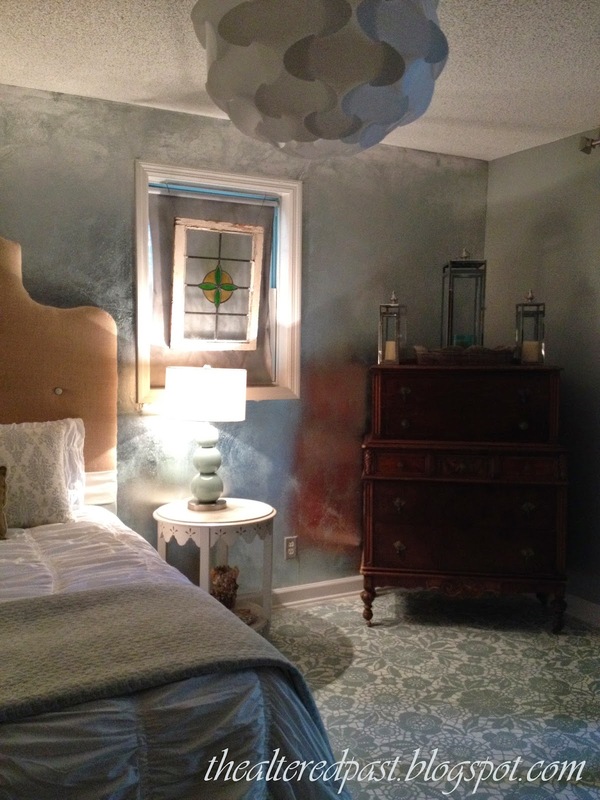 The rug upcycle was one of those projects. 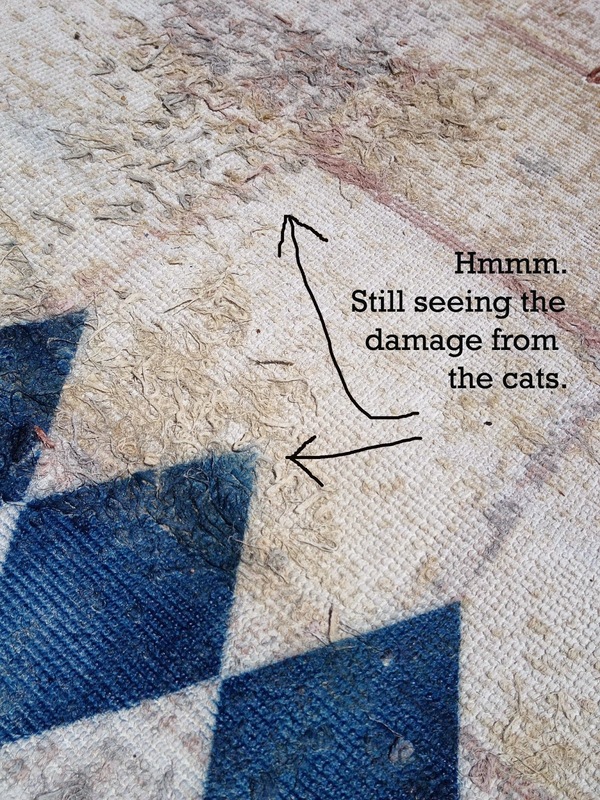 This rug was old, had been in the garage for a while, used as a scratching post for the cats, and who knows what else. So, why did I want to try to even upcycle that for my deck?? Because our two cats and I are at battle over the territory of the deck. It's not a great deck and it's usually too hot to sit out there most of the summer. It's small, uncovered, and poorly constructed. BUT, it's my deck and, by golly, I would like for it to look nice. I figured if the cats were going to live on the deck, I wasn't about to put one more nice thing out there for them to ruin. 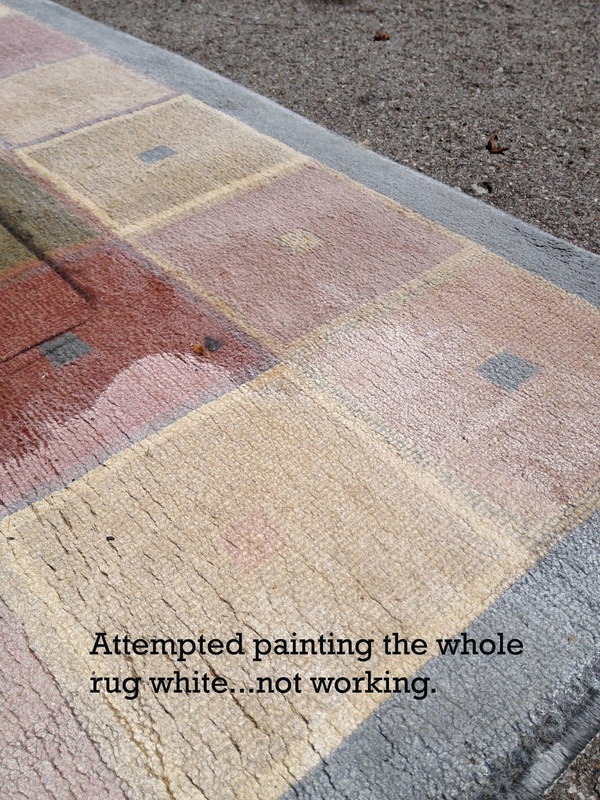 So, I tried painting the rug thinking it would give a nice appearance. Good in theory...bad in reality. 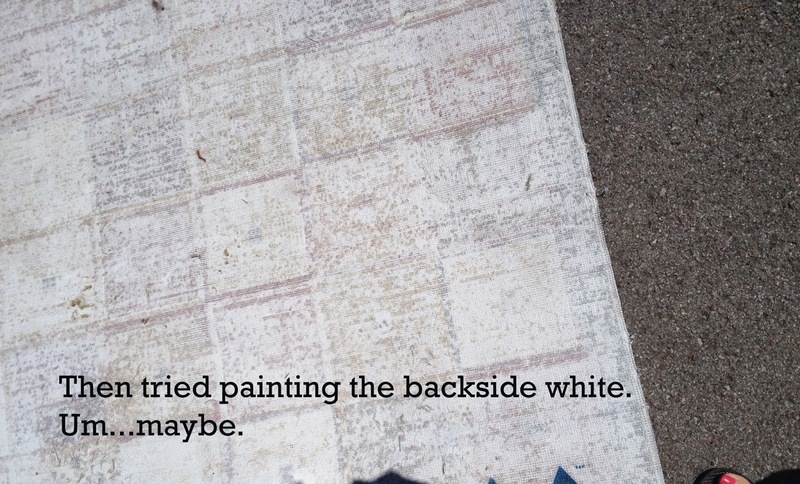 No amount of painting or stenciling was going to hide the fact that the rug was beyond saving. So I decided to stop the insanity and save my paint. Scrap it...take it to the recycle center...it's done! And I'm okay with that. Actually, I was relieved. What is important is that we keep trying. Think about some of the famous people who have their claim to fame from some great invention or accomplishment. What isn't always shared about that person is all the failed attempts they went through to get to that final victory. So, don't give up! 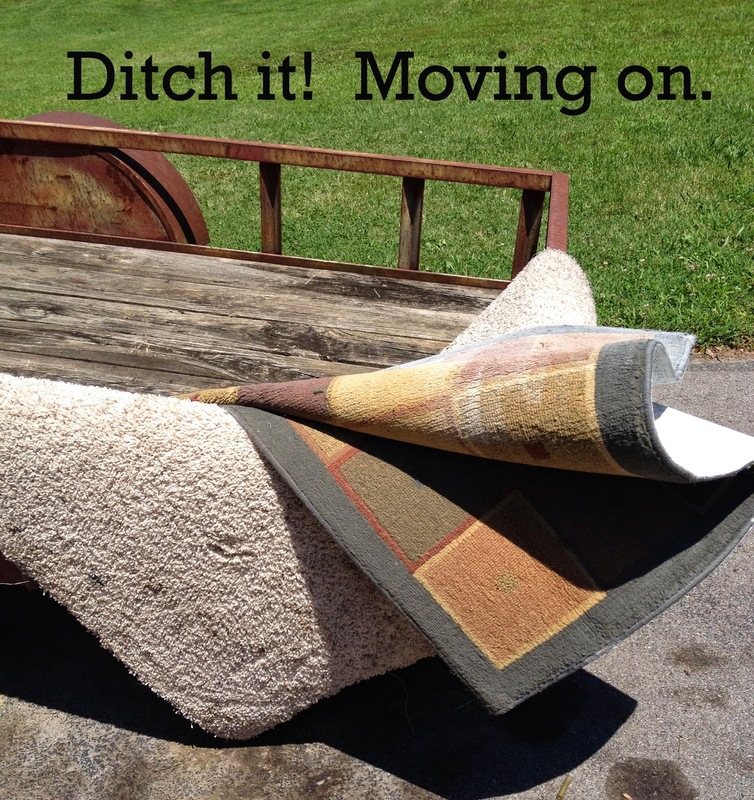 I encourage you to know, it's okay to scrap a project and move on. Not everything is meant to have turn into a fabulous creation. This is one of my oldest signs. It was painted by yours truly back in my high schools days. I painted it for my brother who had just married and they were starting a farm. 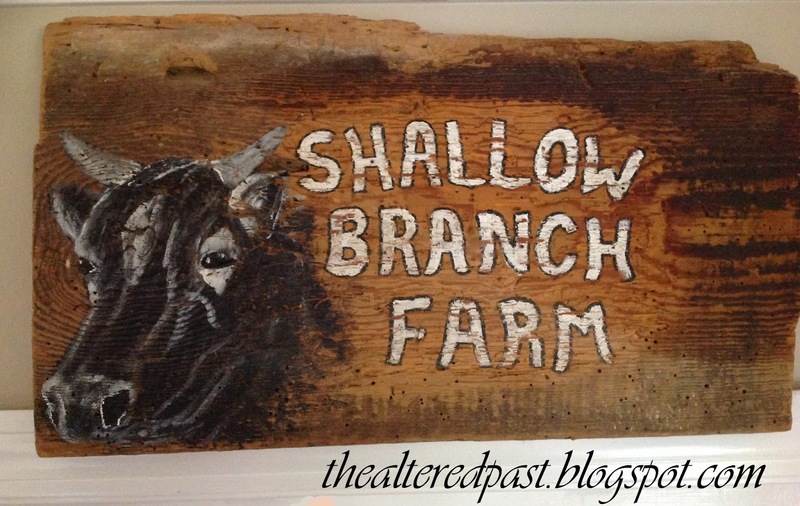 Shallow Branch Farm is still the name of his farm today. It's painted on a piece of old barn wood from my papaw's farm where my brother lives. This sign hangs in my kitchen today. My brother was sweet enough to let me have it. I guess a chalkboard is still signage. It wasn't used as a real sign in it's past life but I love the fact that I can change the message of this sign at any time. This hangs on a door in my kitchen that leads into the laundry room. If you notice the door frame, you'll be able to see some of the marks we've made over the past 9 years of our girls' growth. I think I'll have to take that piece of trim with me should we ever move. This is a painting I created about 10 years ago. 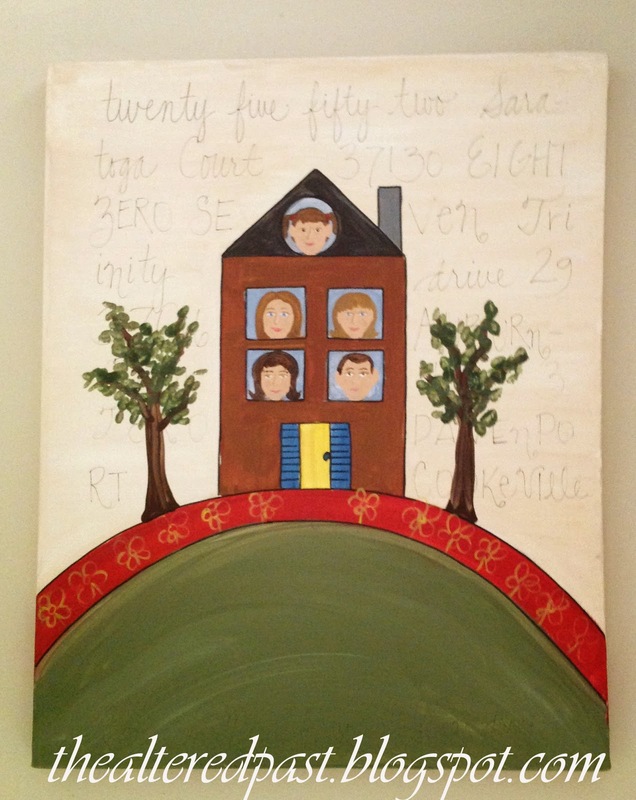 The house and occupants represent me, my husband, and three girls. The writing around the house are of all the addresses we've had since we were married. We've had a lot of addresses. From 1999 to 2005, we flipped houses, that were also our primary residences, as we worked our way through Dave Ramsey's Financial Peace to get out of debt. I could do a whole post on our journey out of debt and may do it soon. It's not easy but s-o-o-o worth it. 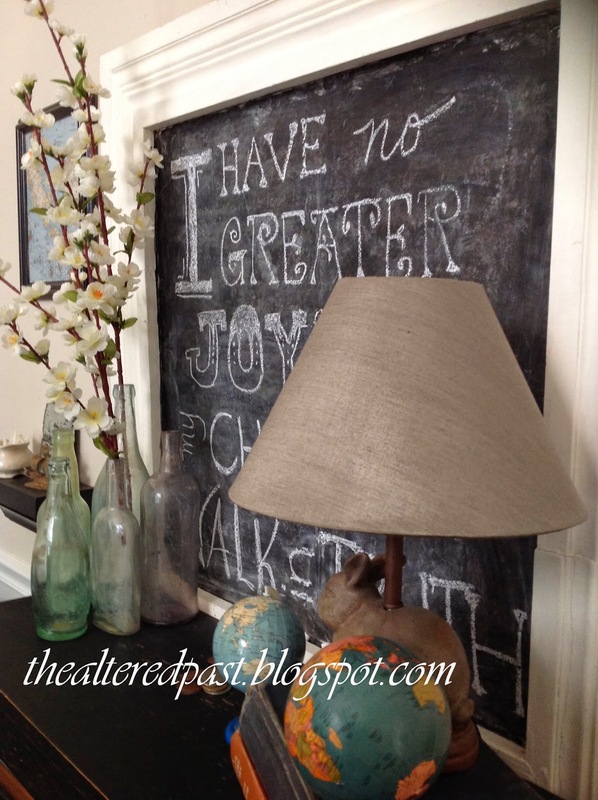 Ok, so this one is another chalkboard but I love it. I purchased the frame at a yard sale many years ago. 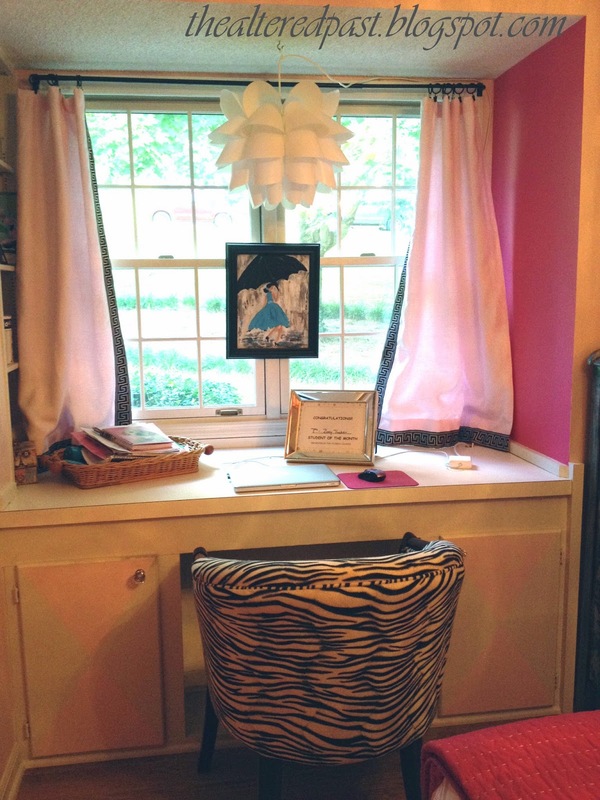 It was painted bright pink and had cork board in it. I began removing the cork board and discovered the tin (which is what I eventually painted with chalkboard paint) was covered with newspaper from the 1950s. It was cool looking at the old articles and ads. This chalkboard hangs in my office on my map gallery wall. 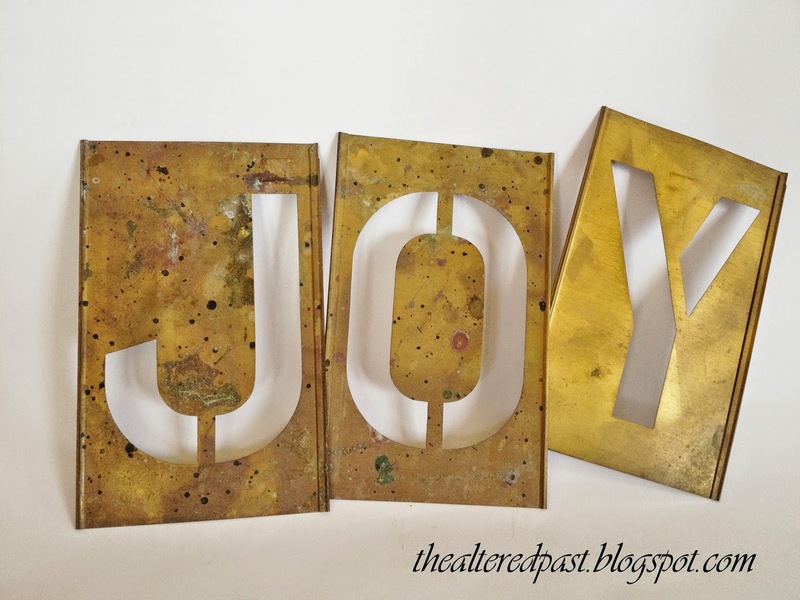 The "JOY" sign brass stencils were purchased at a local antique store. I used them during the holidays and then sold them but I kept another one, the letter F for our last name. Another one of my DIY signs. 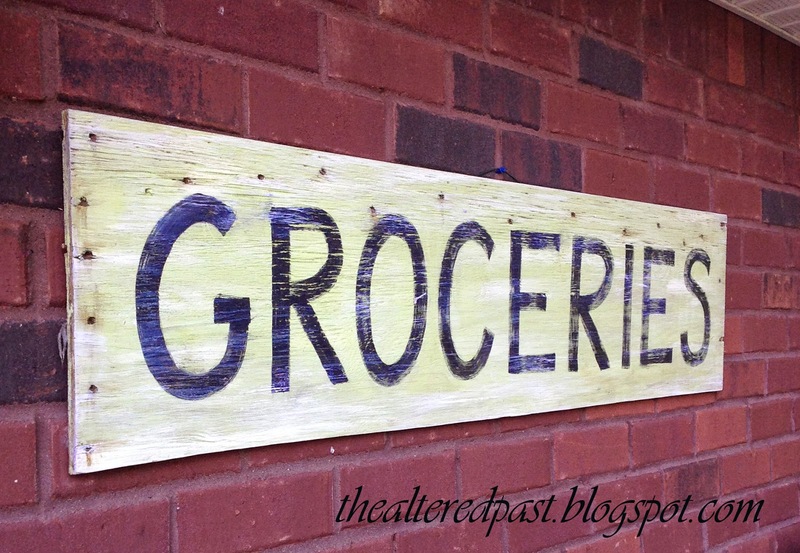 I loved all of the grocery signs that were popular recently but I could never find one. 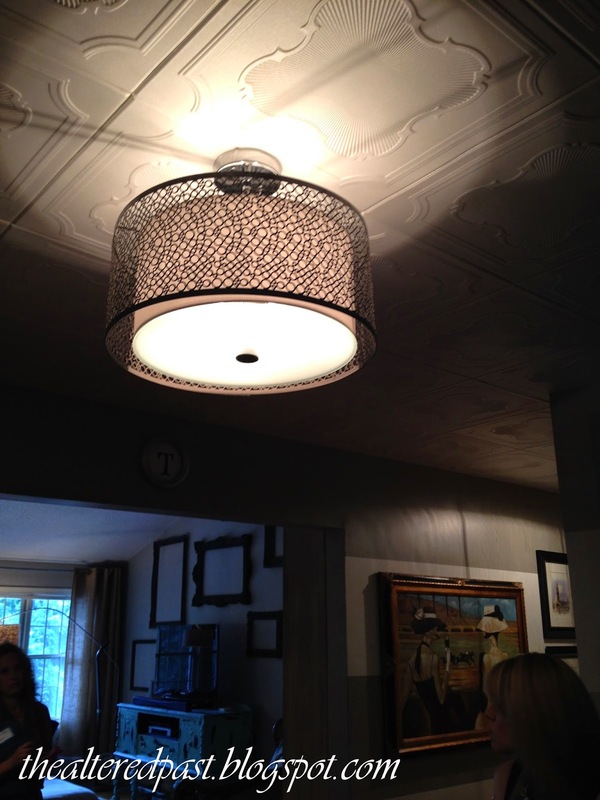 So what does a DIYer do? Makes it herself. The piece of wood had been used for something else originally and was pretty beat up with dings and nail holes. Perfect. 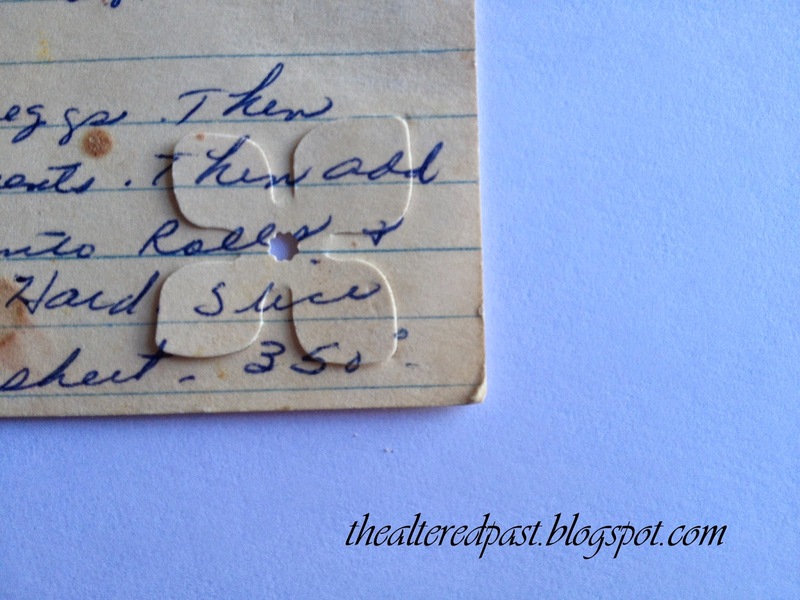 This sign was hanging in my kitchen window before I took it down to create the silverware snowflakes display. Now it hangs on the deck. What are some of your favorite signs? Do you make your own too? I told you that I recently attended my first blogging conference, Haven. 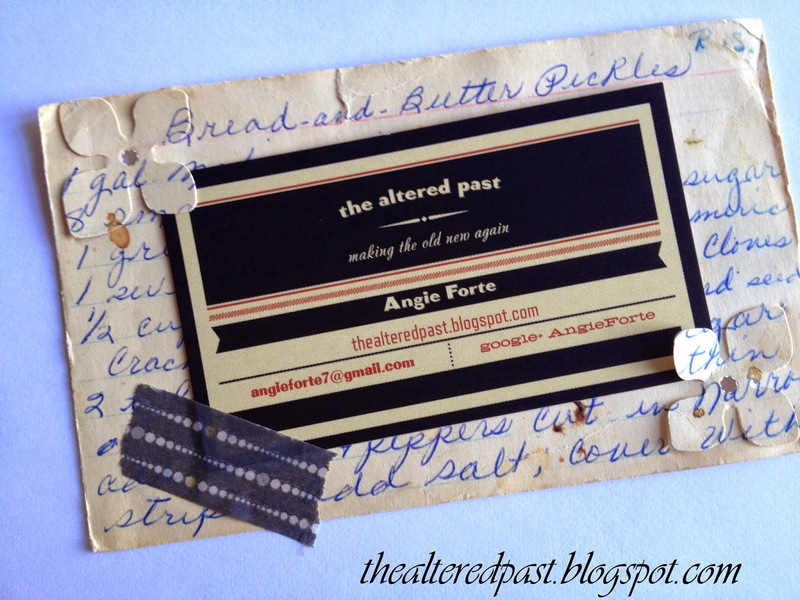 What I didn't share were my business cards that I made prior to Haven. Ordered some snazzy business cards with all my perts. 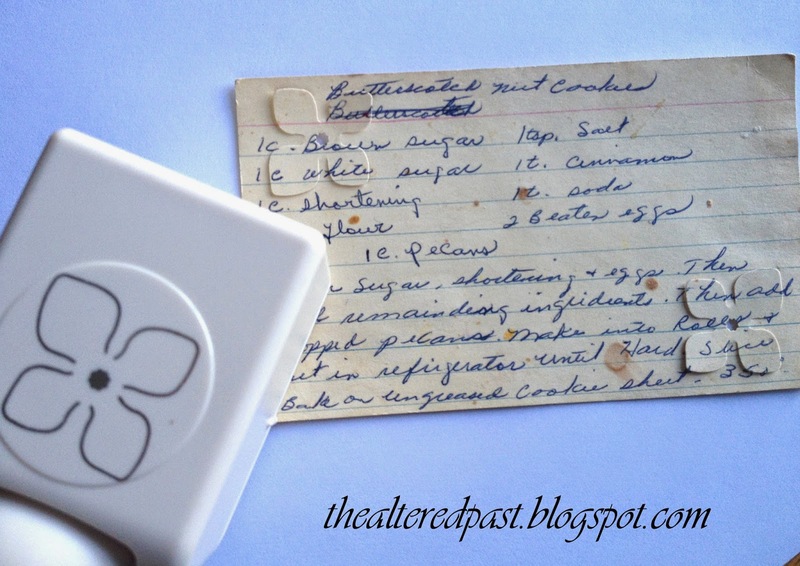 Located one awesome Martha Stewart paper punch. This paper punch doesn't punch all the way through. Some of the flower image is still attached, allowing it to make a 3D effect. See? Awesome. Now, the card was looking great but I needed to add a little something to hold some swag. I found this! 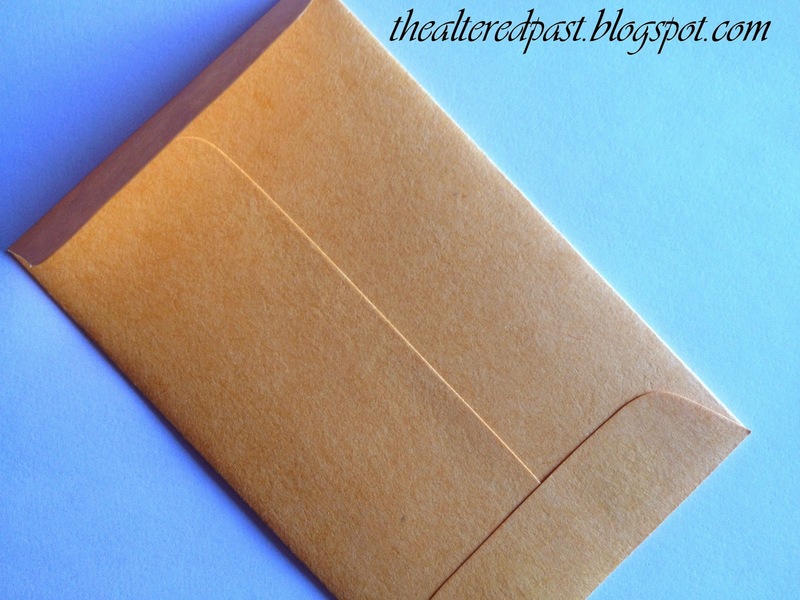 A small manila coin envelope. Perfect size to add to the card. 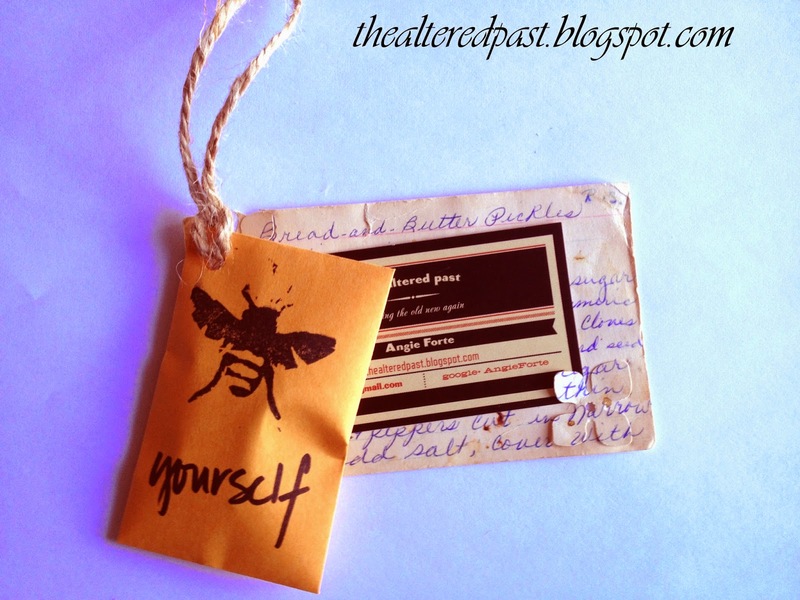 Under the bee, I wrote "yourself"...get it "bee yourself!" 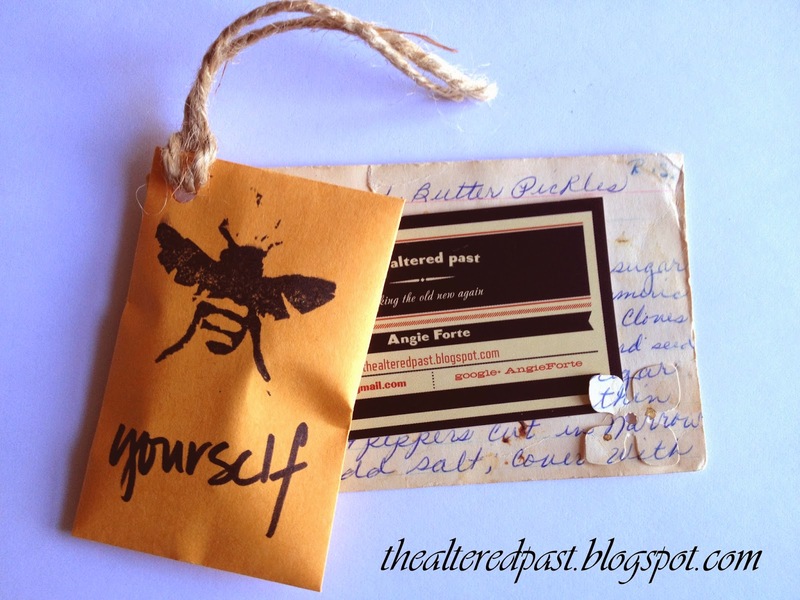 Because we DIYers are never satisfied, I had to create another stamp with another saying. 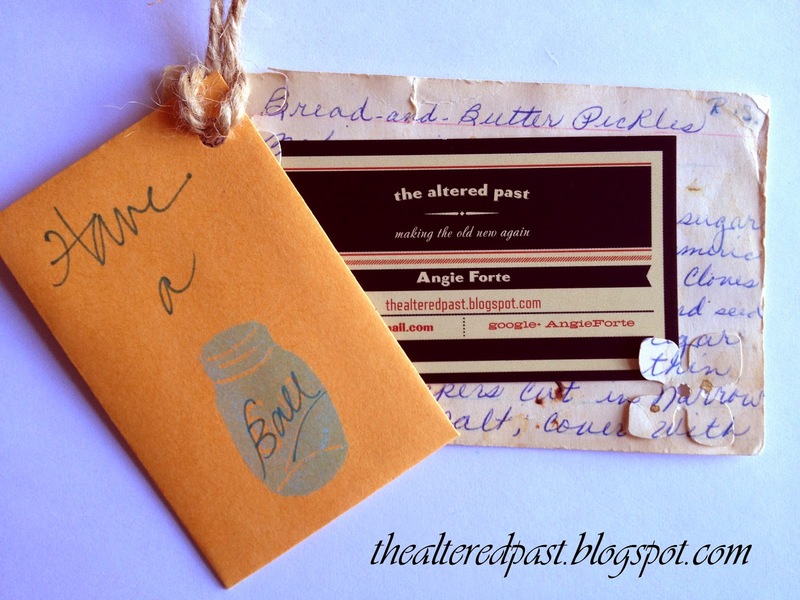 In this one, I carved a Ball mason jar because don't all home/lifestyle bloggers love mason jars?! The message here was "Have a Ball" at the conference, at home, at life...whatever you do. I hope this sparked some ideas for you. I enjoyed sharing these cards at Haven...all 50+ of them. The greatest part was that in exchange, I received 50+ cards from all the great bloggers that I met. Now, I have to interrupt our post to mention this. 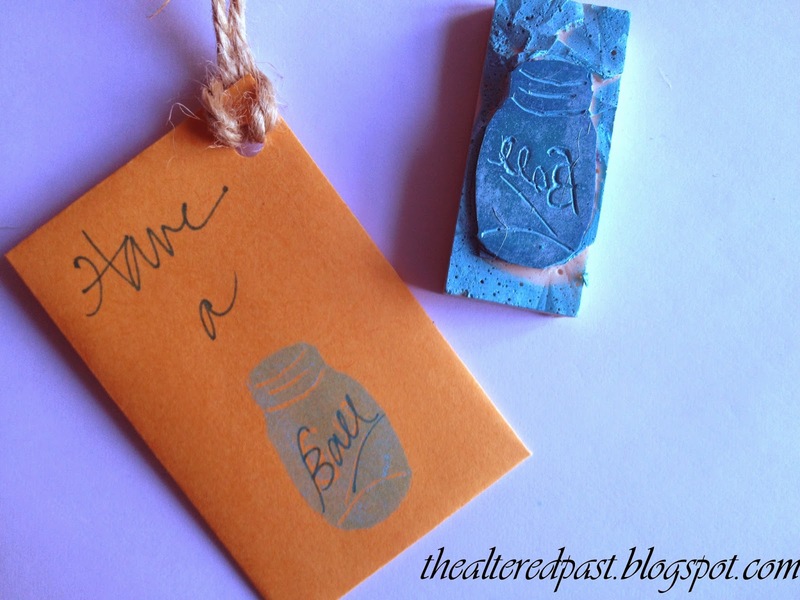 The first Ball jar stamp that I carved was totally awesome. That is until I inked it up and stamped my first envelope. 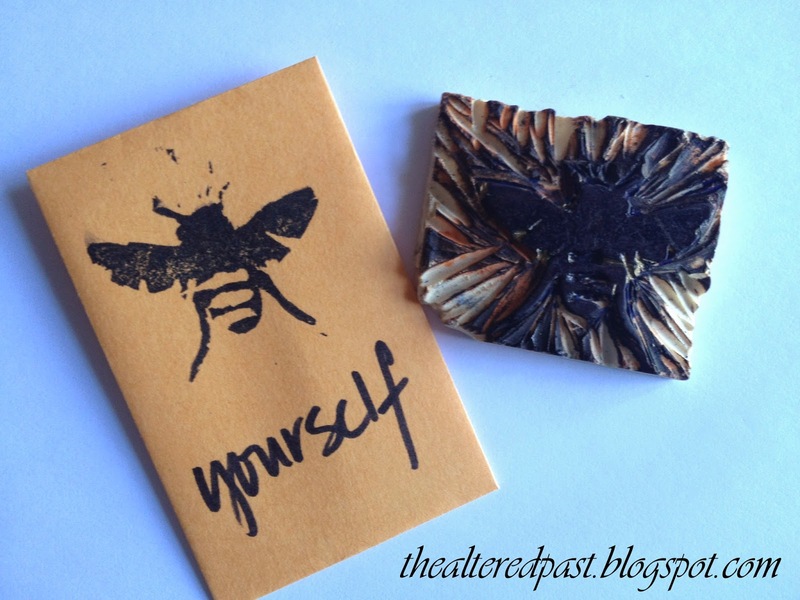 Do you know the first rule in stamping words or lettering?? Yep, it has to be mirror image. It actually took me a third try to get the lettering and a jar shape that I was happy with. See, we all have those less than perfect attempts at doing things. Kind of like Babe Ruth, the Sultan of Swat. Did you know he was also once known as the King of Strikeouts? Yep. Michelangelo said, "If people only knew how hard I work to gain my mastery, it wouldn't seem so wonderful at all." No one gets it right the first time, everytime. It does take work but it also takes allowing yourself to fail in the attempt. 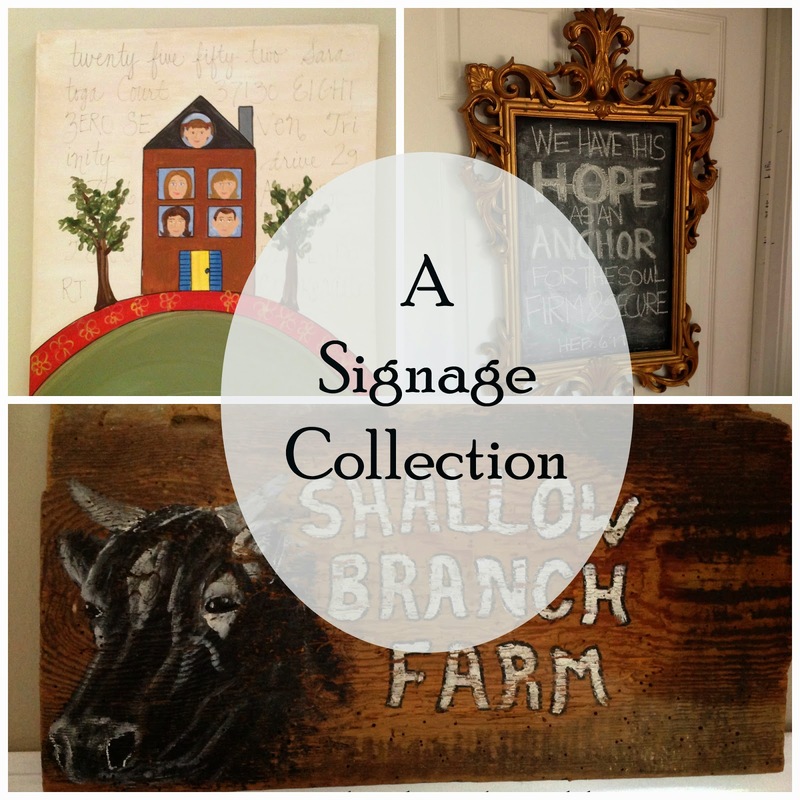 So, even though I love sharing beautiful projects, I also want you to see that they don't just happen. There are a lot of "fails" beforehand. Beginning this Friday, I am going to begin a regular post entitled "Reality Check". Believe me when I say, I have lots to share in this area. Thanks for stopping by and God bless!! 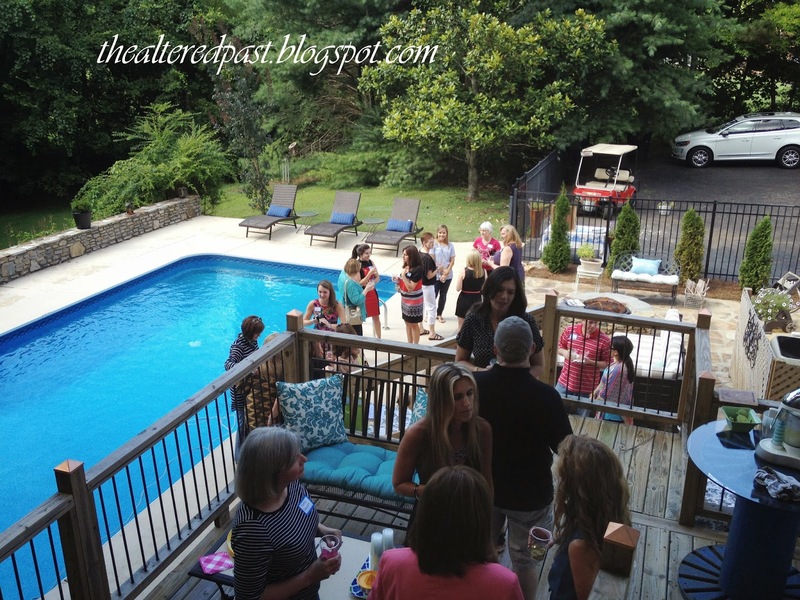 This past week I was honored to be invited to a small get together for #NashvilleInfluencers, Nashville area bloggers, designers, columnists, television hosts, and media specialists. 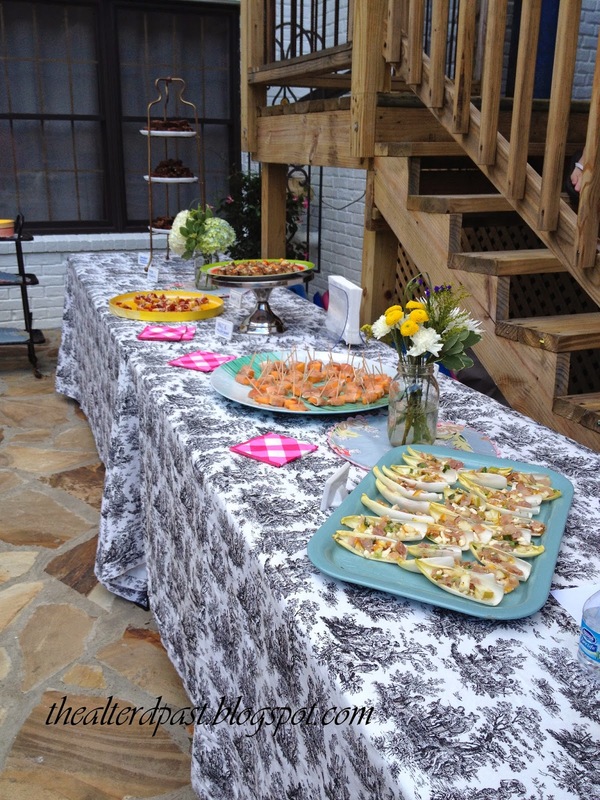 It was hosted by Dana Tucker and Nancy McNulty of Forest Home Media and was held at Dana's beautiful home in Franklin. After we all got to meet each other, chat, and refresh ourselves with some delicious Southern Breeze punch (recipe at the end of the post), margaritas, wine, and tasty appetizers, Dana treated us all to a tour of her home. And, I get to share it with you! We started in the foyer. Notice the ceiling. 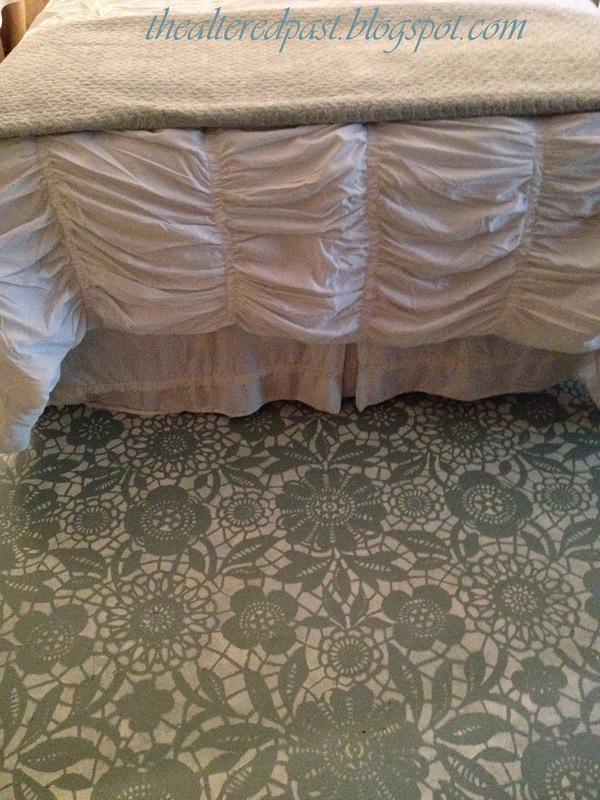 Rather than remove the original popcorn ceiling, they chose to cover it with these beautiful tiles. Love the look! Dana and her husband are the creative genius behind Bella-Tucker Decorative Finishes (you'll notice all of the beautiful painting techniques in the following pictures.) They painted the hallway with large gray and white stripes. The scale works perfect here. 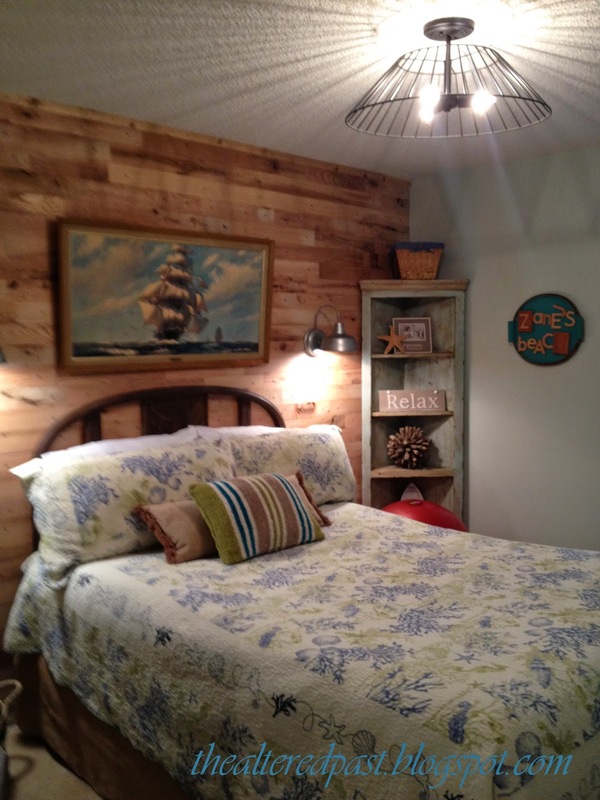 Check out the family room! They changed the color of the brick with paint and added a piece of rusted metal roofing above. 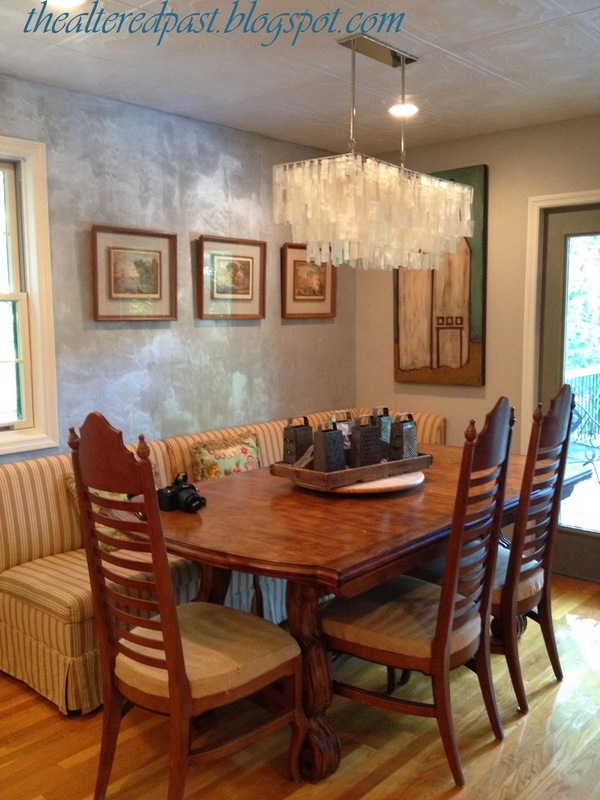 Adjacent to the family room is a sitting area. 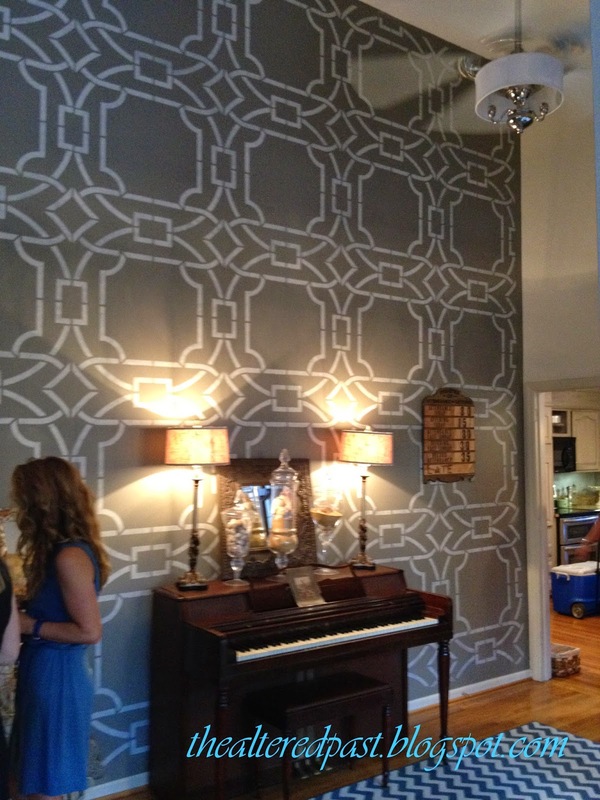 They stenciled this beautiful pattern on one wall. 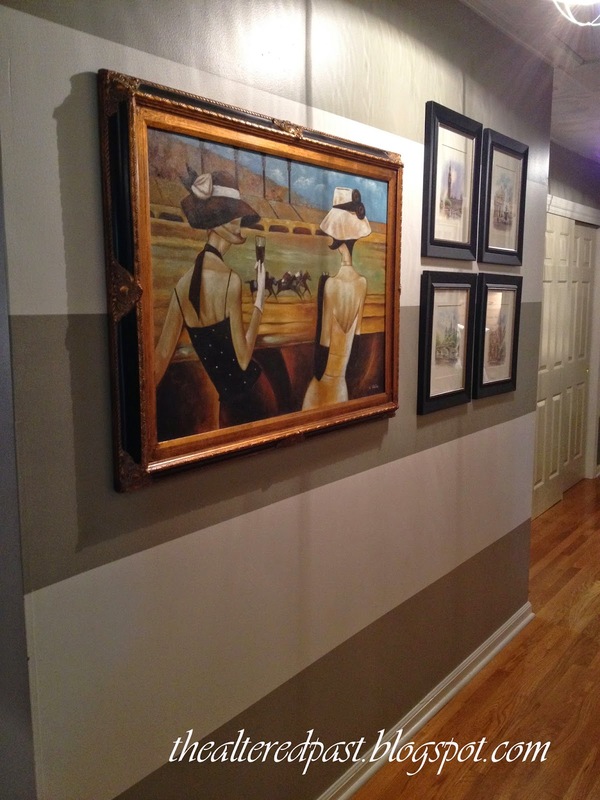 Like the stripes in the foyer and hallway, the scale of this pattern works perfectly on this large wall. 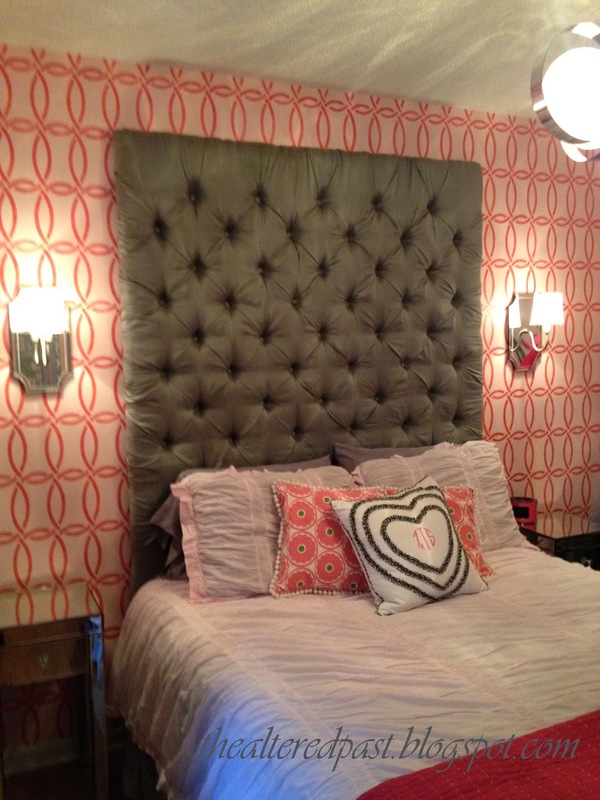 This bedroom belongs to Dana's daughter. I didn't capture how great this room really looked. 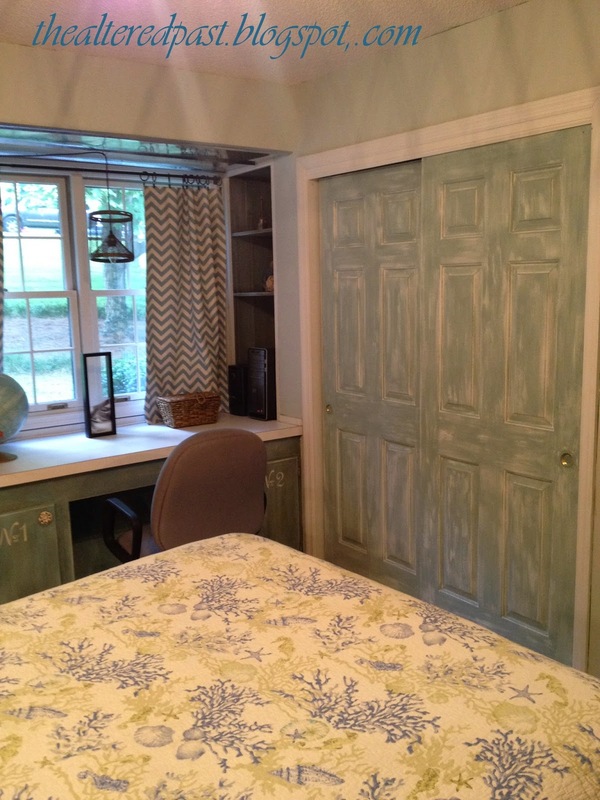 Their son's room with plank wall and distressed closet doors...perfect for a boy! The sitting area in the kitchen. Did you notice the shimmer on the wall? It's silver and it's gorgeous. This is in her kitchen leading to the deck. 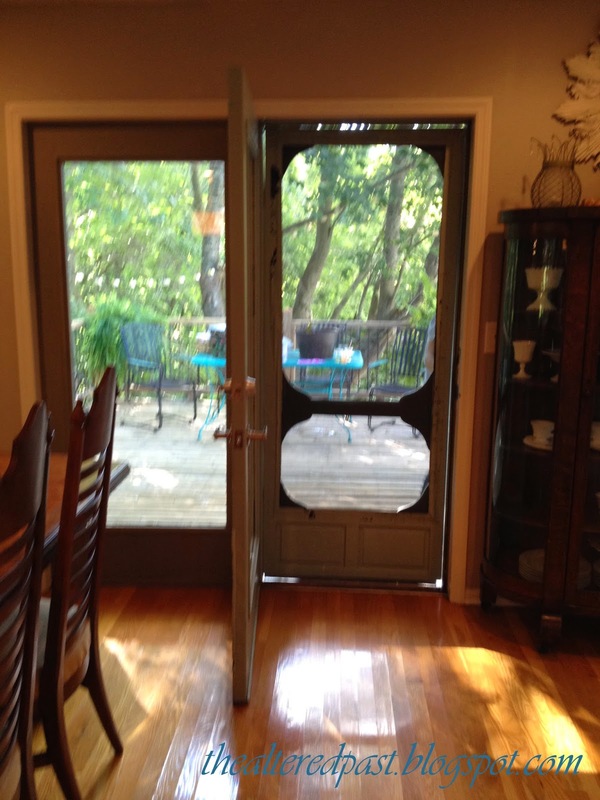 Who knew you could put a screen door on French doors? Ok, Dana knew and she did it. I'm making a mental note for any French doors in my future. Dana's whole house is incredible but I think this is my favorite room. 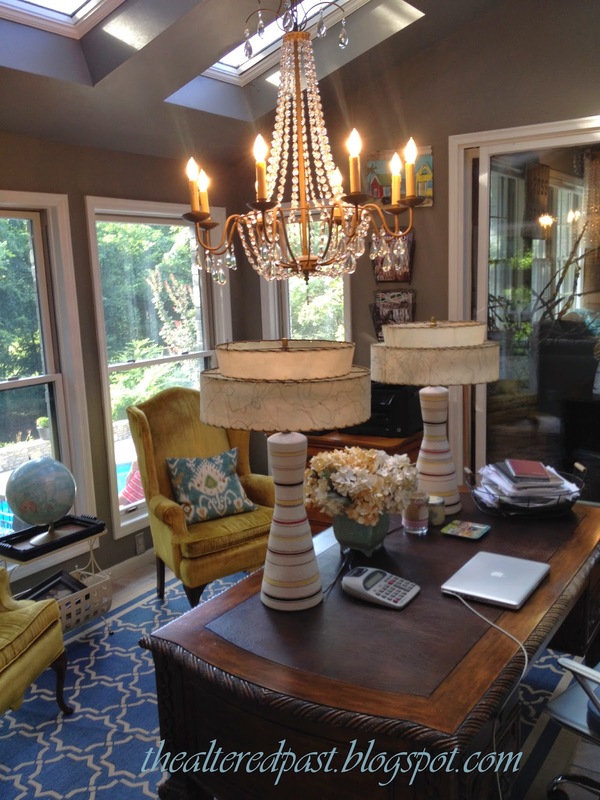 It's her home office...lots of natural light, great vintage pieces, and a beautiful chandelier...l-o-v-e it! Although there were many more, I've got one last room to share. This one is downstairs and has a silver wall like the kitchen. And, look at the floor. Know what that is? 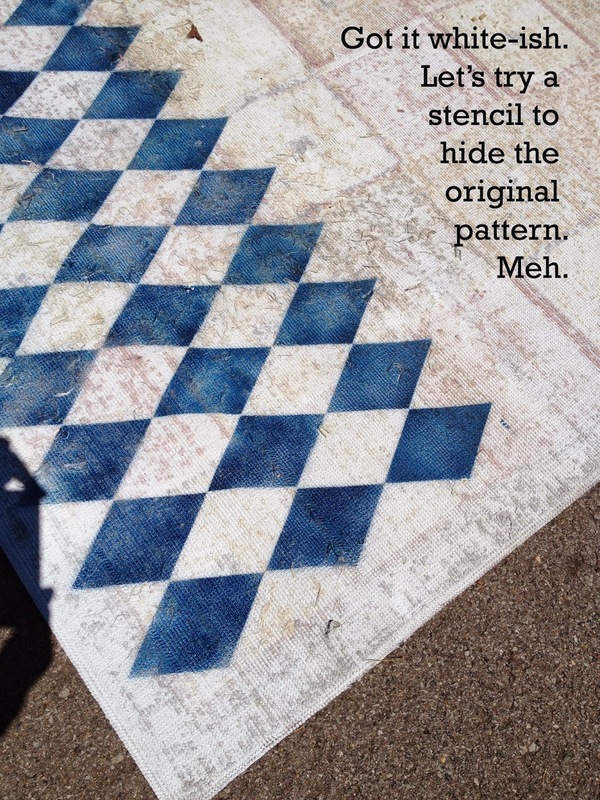 It's a stencil on painted concrete. Really, it is! It looks so good, it's hard to believe that's a concrete floor. Dana's house is even better looking in person. I hope you enjoyed the tour. 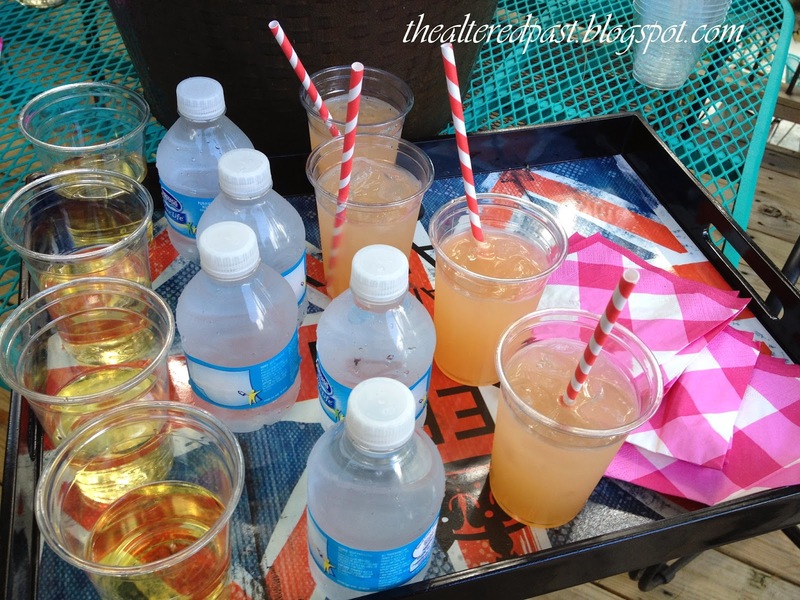 Here's the Southern Breeze punch recipe I promised. It came from Carmen Johnston, the garden lifestyle expert with Southern Living Plant Collection, who attended the party as well. Note: The raspberry ice cubes can be made in advance and stored in heavy-duty zip-top plastic bags in the freezer until ready to serve. I spent this morning running to a few of my favorite pickin' spots. Let's just say it was a good day for picking! Some days aren't so good but not today. 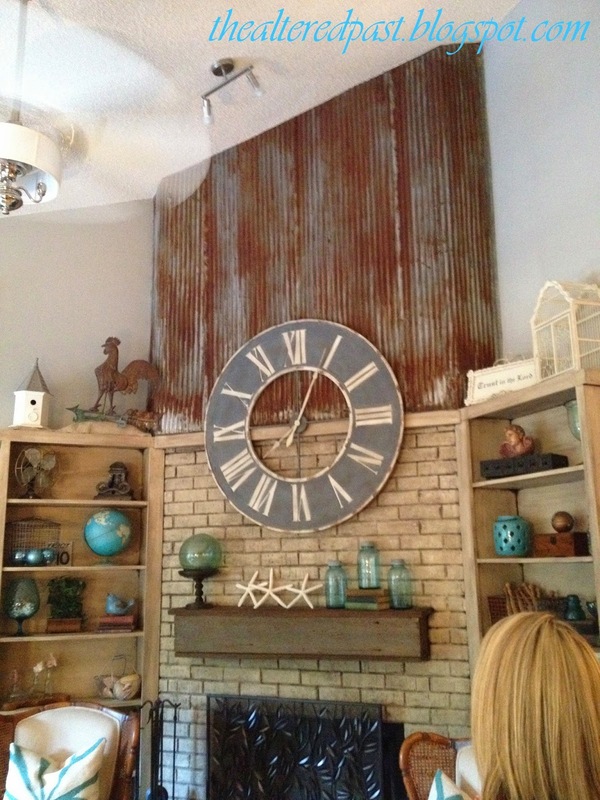 I found these two galvanized chimney pipe tops. Not exactly sure of their correct name but it doesn't really matter as pretty soon they are going to be pendant lights. 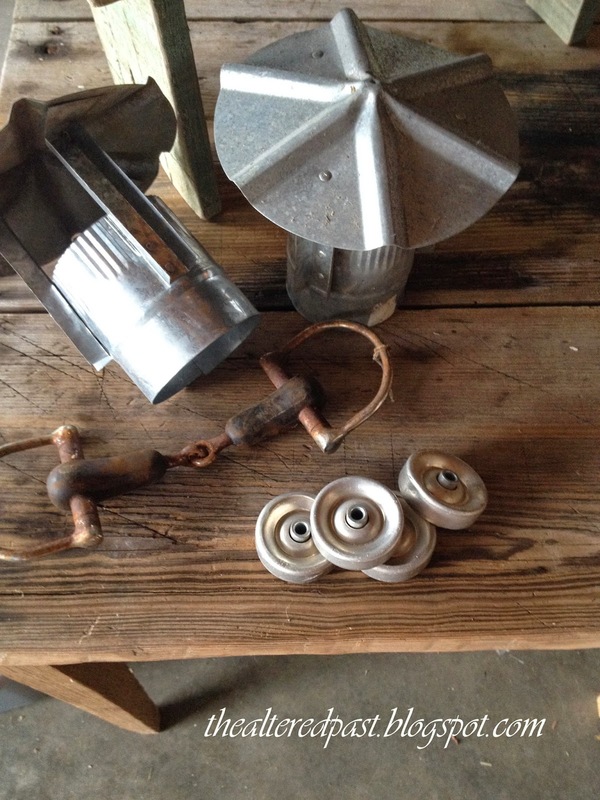 I also found the bridle piece and 4 aluminum wheels. I always need wheels for projects so they will just go in my stash for later use. I also bought a large road sign from an old Tennessee State Highway but daughter number 1 claimed it for her apartment. We moved her in this afternoon. Sigh...my nest is emptying. 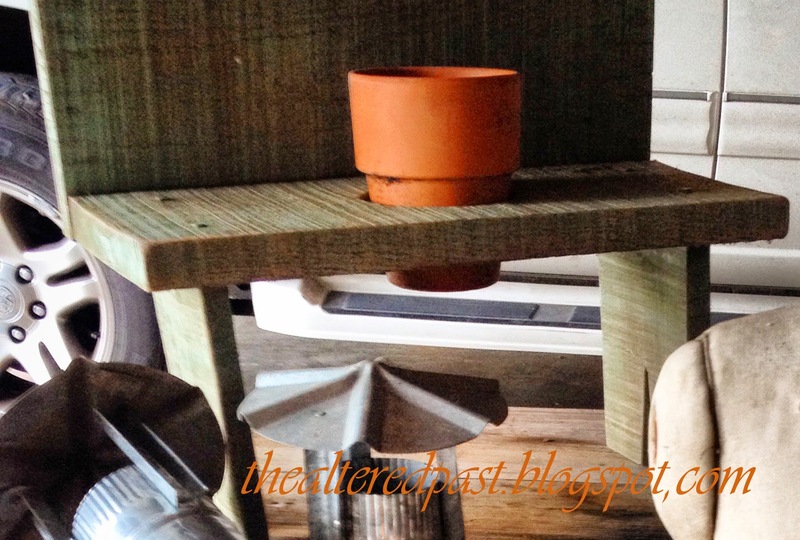 The barnwood planter is heading to the deck for a little deck redo. And, this guy needs a little cleaning before I decide where he will live. It's expected, considering his age. 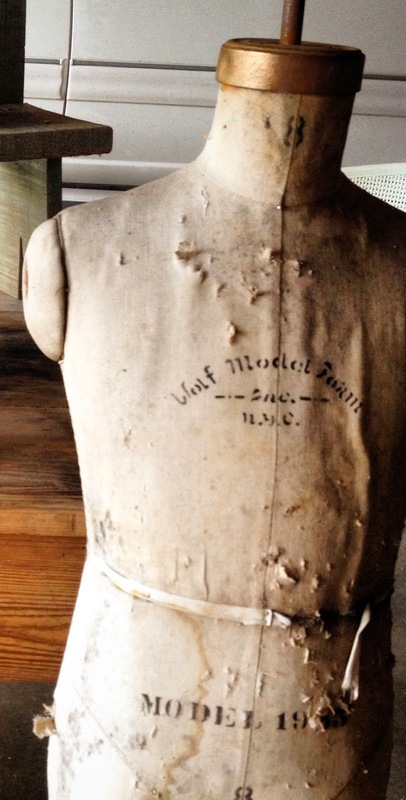 I think this model is a hanging model from the 1940s. I still haven't decided if it's really cool...or really creepy.